In April 2005, SuperCasino began life as an around-the-clock television station broadcasting roulette. To this day, ten hours a day, punters can still tune in on Sky - a channel our stellar TV Adverts appear - for live-dealer roulette gameplay hosted by a roster of talented and experienced presenters. When the live presenters go off the air, the channel continues broadcasting using an automated roulette wheel, so players can tune in and bet 24 hours a day. But since starting the channel a decade ago, SuperCasino has now expanded their reach to include a top-notch online casino, offering some of the most popular online casino and live-dealer games. Although most familiar with the brand might assume live-dealer play is the highest quality product offered, SuperCasino's traditional online casino offering boasts a ton of topnotch titles; the live casino products certainly doesn't overshadow the already independently successful casino offering. As one would expect, live-dealer roulette is what SuperCasino does best, a claim they corroborate on their site. Whether watching on television or on the stream sent directly to the site, customers will be hard pressed to find a better live roulette experience on the internet. They also boast some of the best and most popular slots around. Outside of all the roulette tables and variations on offer, SuperCasino also provides blackjack, craps and sic bo tables as well. Unfortunately, only roulette, blackjack and baccarat received live-dealer versions at SuperCasino. The entire SuperCasino outfit is powered by the number one software supplier in the world, Playtech. Combine Playtech's expertise with SuperCasino's excellent in-house development team and you have these incredible offerings. In terms of live games, SuperCasino is the industry leader. Regular table games and fan-favorite slots coexist in the well-designed site as well, offering all kinds of players something to enjoy. Roulette enthusiasts are sure to want to turn to SuperCasino first above all other operators but blackjack, slot and craps lovers shouldn't shy away from this stellar online gambling experience either. 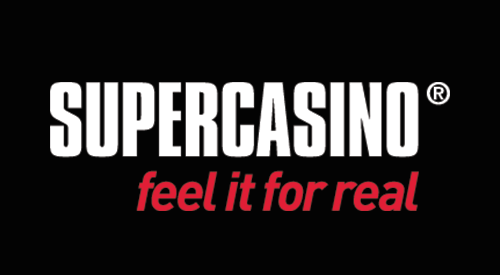 Some would wonder why an established brand like SuperCasino would only stick to traditional casino offerings when others in their same situation have expanded into other gambling products like bingo or poker. But this curiosity should be replaced with admiration as SuperCasino clearly saw the opportunity and turned it down to ensure their original goal of becoming the most elite online casino wasn't overshadowed by expansion, a true testament of their dedication to their casino-loving users. GENERAL BONUS OPT IN REQUIRED. ONLY AVAILABLE ON FIRST DEPOSIT. 100% BONUS UP TO MAX £200. 25X WAGERING APPLIED FOR BONUS AND DEPOSIT. 30 DAY BONUS EXPIRY. CONTRIBUTION TO WAGERING REQUIREMENTS VARIES BY GAME. ELIGIBILITY RESTRICTIONS APPLY. FURTHER T'S AND C'S APPLY.